Ronke Akerele is an executive in the healthcare sector in UK. She is currently the Director of Innovation and Transformation at Hertfordshire Partnership Foundation NHS Trust. She is also a honorary lecturer at Imperial College, London. Ronke Akerele is a performance and change management professional with experience in strategy execution, performance management, service transformation, information technology and programme management in the public and private sectors. Prior to her current role, she had held senior positions in Imperial College Health Partners, BUPA, Career Quality Commission (UK), Accenture, PWC and HealthGravitas. 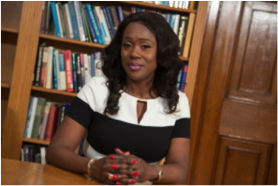 Ronke Akerele holds a BSc in Economics, MSc in Information Technology, MBA and has undertaken Executive Education programmes both in London Business School and Harvard Business School. She is currently completing her Doctorate degree in Organisational Change. Her love and empathy towards orphans and vulnerable children gave birth to Heritage Outreach, a charity registered in the Nigeria and UK to cater for orphan and vulnerable children. Ronke Akerele is married to Femi Akerele and they have 2 beautiful children.